Hyderabad Runners Society, organizers of the 6th Edition of Airtel Hyderabad Marathon who have been consistently promoting running a preferred form of fitness activity for an active lifestyle since 2007 in Hyderabad and Secunderabad. Hyderabad Runners today organised a TRAIL RUN of 21.195 km. 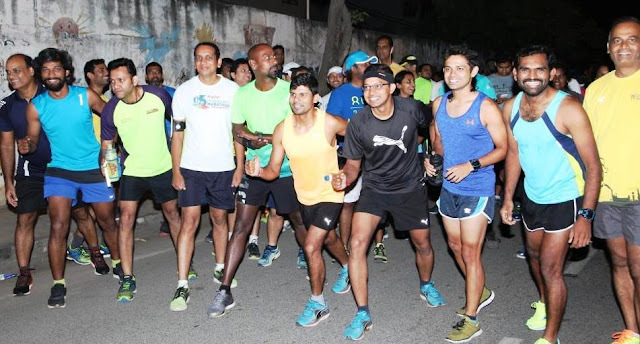 The run started at 5:30 am from necklace road people’s plaza to Gachibowli Stadium via Banjara Hills, Jubilee Hills, Madhapur, Hitec city, Mind space, Bio Diversity Gachibowli. Over 300 runners participated in this preparatory training run. Run was followed by breakfast Sponsored by OPTUM. Hyderabad Runners Society, aims to promote running as the preferred form of fitness to achieve active & healthy lifestyle. Hyderabad Runners are also organizing Airtel Hyderabad Marathon for last 5 years and brings 6th Edition of Airtel Hyderabad Marathon which is scheduled on 27th Aug for 5 KM and Full Marathon (42.195 kms), Half Marathon (21.095 kms) will be held on August 28th from Peoples plaza necklace road and on the same day 10 K will start from Hitex and all the 3 runs will finish at Gachibowli stadium. Founded in 2007, a good four years before the Marathon began to run across Hyderabad, the group currently has around 3500 members. The members dedicated its endeavour to inculcate community running culture in the city and roping in people from all walks of life. The baby steps covered shorter runs before the half and full marathons made their place on the map. Their Mission is to promote active lifestyles amongst the public and make running as the preferred form of fitness activity in and around the twin cities of Hyderabad and Secunderabad.